Each unique bouquet is made with love and careful workmanship by Susan who is a skilled and experienced artisan. Her work is flawless with the best service to you.. I aim to please and satisfy and will be excited to make your bouquet – It will leave here looking gorgeous and most beautiful. Beautiful jewellery is collected internationally and locally. I have an extremely high standard and bouquets have been sent all over the world with only positive and wonderful comments about my work. You can rest assured that your bouquet will be the best ever for you and will take your breath away. 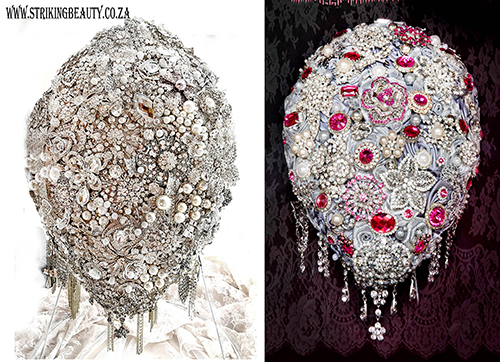 Create glamour and interest with a BROOCH BOUQUET. It creates conversation instantly and brings you dress to life by complimenting your style. A Brooch bouquet does not have to be on your wish list. Your wedding day is a once in a lifetime event and is very special and you should have what you want. Brooch bouquets come in all prices to suit your budget with payment options. A BROOCH BOUQUET is not something paid for and discarded on your wedding day WITH BROWN AND SAD PETALS - YOUR SPECIAL BOUQUET SADLY THROWN AWAY – it is a keepsake and heirloom to cherish forever. Choose the very best for your wedding day as it the one thing besides your photos to have and display with love afterwards as a lasting memory of your wedding day. TO DAY’S BOUQUET IS TO MORROW’S TREASURE. Each bouquet is unique and made with handcrafted, artistic, fine and professional detail. I will make something fabulous and gorgeous for you to suit your distinct personality. It takes years of practice and experience to be able to do so. You can have sophisticated glamour, shabby chic, vintage, beach theme or any other theme your heart desires. Bouquets are for brides, bridesmaids, flower girls, mother of the bride, birthdays, 21st , vow renewals and pageants etc. or for any other occasion. Corsages, hair pieces, garters etc. can be made to match. Gift vouchers are available and a gift of a brooch bouquet to the bride is MEMORABLE. If you are going away take all your bouquets, corsages etc. with you – you won’t have to source fresh flowers and they will last. YOUR BOUQUET WILL ARRIVE WELL IN TIME, AND NOT AFTER YOUR WEDDING THEREFORE NO STRESS - IT WILL BE UNIQUE IN THE WAY YOU WANT IT TO BE AND NOT MASSED PRODUCED ..THE JEWELLERY WILL ALSO BE SPECIAL.I HAVE HAD TO DO RUSH BOUQUETS BECAUSE OVERSEAS ORDERED BOUQUETS HAVE NOT ARRIVED IN TIME OR AT ALL,. OR ARE VERY DISAPPOINTING IN THEIR CONSTRUCTION AND APPEARANCE..